New Wildcats dash across Deering Meadow this Wildcat Welcome prior to taking their class photo. Among the incoming students, the proportion of international students hit a record high this year. Before coming to the United States from Thailand, McCormick freshman Akhil Shanishetti had never attended an American football game. He finally got his chance at the game against Eastern Illinois University this month during Wildcat Welcome, running with the rest of his new classmates as part of the Wildcat Dash tradition before kickoff. 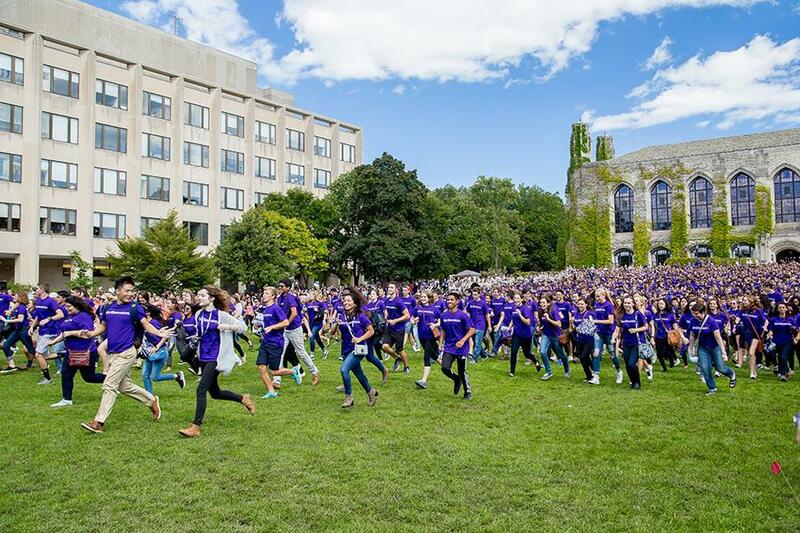 Shanishetti is just one of the 1,700 undergraduate and graduate international students Northwestern welcomed this year — a record for the University, said Ravi Shankar, director of the International Office. This increase brings NU one step closer to achieving its globalization goals set in the University’s strategic plan, he said. Since the plan was announced in 2011, international enrollment has been on the rise, according to NU’s 2014-2015 International Student and Scholars Statistics report. NU’s international population has increased to more than 6,000 undergraduate and graduate students compared to 4,329 last year. NU administrators said this is largely due to four factors: intensified efforts to reach out to international communities, increased financial aid, effective pre-orientation programs and a supportive on-campus environment. According to the International Office’s statistics report, the highest represented country for NU’s undergraduate and graduate population during the 2014-2015 year was China, with 1,164 students enrolled, followed by India with 369 and South Korea with 286. Compared to the 2012-2013 year, the number of students from Brazil increased from 53 to 97; the number of students from Turkey increased from 47 to 93; and the number of students from Mexico increased from 58 to 76. Thailand and Israel, which before had not made the top 10 most represented countries, had 91 and 55 students, respectively. Mills said University President Morton Schapiro is also actively connecting with students overseas. As a result of his efforts, Shankar said Schapiro has helped establish NU’s brand internationally. In 2009 — Schapiro’s first year at NU — he made 21 trips abroad, speaking at and attending events across Asia, the Middle East and Europe. The President’s Office was unable to provide the latest figures on Schapiro’s international trips as of Sunday evening. With international students making up 10 percent of the freshman class — also an all-time high — the University is holding its own against its peer institutions, Mills said. The University’s academic reputation is one of the main reasons McCormick sophomore Rohil Bhargava, who was raised in Malaysia, decided to transfer from University College London. Despite being attracted to NU, international students still have to face the challenge of adjusting to attending an American university, said Weinberg freshman Celia Hauw, who grew up in Singapore. “People are generally very nice, but obviously they act in a different way compared to Singaporeans. So it takes a bit of getting used to,” Hauw said. To help the transition, the staff at the International Office coordinates programs such as NU In, a pre-departure orientation program for international students, and the International Student Orientation, both of which are yielding positive results, Shankar said. NU In sends University representatives to the countries with the highest amount of incoming students to brief them about life in America, preparing for college and other NU-related topics. ISO is an on-campus orientation program, which takes place a few days before Wildcat Welcome. Melania Hidalgo, a Medill freshman from Spain, said she enjoyed connecting with fellow international peers and finding friends early on. In addition to having an established group of friends, support for international students continues after the orientation period is over, Shankar said. Shanishetti, the McCormick freshman, said he felt the International Office’s programs were essential in making it easier for him to get used to campus life. To continue increasing international enrollment, Mills said administrators plan to maintain connections with international high schools and college advisers. He also said the University is in contact and hoping to receive donations from overseas benefactors. One of these prospective benefactors is an influential Chinese real estate couple who set up a $100 million education fund to send Chinese students who otherwise could not afford the price tag of elite American universities. Pan Shiyi and his wife Zhang Xin have already made a $15 million gift agreement to Harvard. This donation would be the second major contribution toward NU’s international studies program. 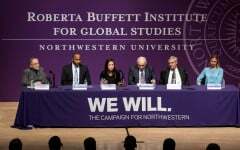 Last year, roughly $20 million of the more than $100 million from Roberta Buffett Elliott’s donation to the University was set aside for a scholarship fund for international students.